We live in a day and age where people are always connected, looking for the latest and most up-to-date information. KZUM is working toward providing this not only on the airwaves, but via our website and social media. KZUM currently broadcasts 125 hours of original, locally produced programming each week thanks to over 90 volunteers. You’ll hear sounds ranging from blues to punk, hip hop to folk, rock to electronic and much more, plus syndicated shows like Democracy Now!. We also have shows focused on community matters, environmental issues, health, gardening, pet care, and human services. Plus, culturally driven talk and music programs broadcasted in English, Spanish, and Vietnamese. We are actively working toward becoming a resource—a hub, if you will—for all things local.We see kzum.org becoming a site that is visited daily, informing our community what is happening in arts, music and culture right here in our ever-growing, vibrant city, all while streaming KZUM live. We are looking for students and recent grad students who are killer storytellers, creatively intellectual and sterling writers. Photographers and videographers who seize the moment and aren’t afraid to jump in the crowd and get in the action. Designers who think out of the box, are innovative, all while tying “it” all together to concisely express the message visually. Candidates should be able to work solo and with a diverse team. Interns should communicate clearly, stay on task and be receptive to constructive, supportive criticism. You should have a love for all things art, music, and culture and be excited to share what is happening in our community! We are looking for people who are passionate, who not only can see, but feel a moment happening, with the willingness to dive in to capture it, visually and verbally. One who is a multitasker, a go-getter, can handle the pressure and excitement of what can come next and can adapt easily to unexpected changes. Candidates should be able to work under strict and demanding deadlines while genuinely being engaged in their surroundings. We want you to take pride in what you are doing and recognize that you are single-handedly helping an organization develop in areas that will lead to its overall visibility and sustainability. Not to mention, the overall impact in the Lincoln community. In return, you will receive public relations and media experience, the opportunity to work hands-on with multiple public figures within Lincoln’s creative and professional community as well as the opportunity to develop your personal portfolio in a deadline-driven environment. Plus, that great feeling of making an impact in your community. Producing and publishing show previews and recaps, as well as artist interviews. Covering special event and cultural happenings, First Friday and gallery profiles, and any other writing assignment we throw your way! Sharing what’s happening in the moment via our social media outlets. Updating and publishing the KZUM community calendar. Assisting our administrative team during the station’s Fund Drive. Attending all KZUM and KZUM-sponsored events. Photographing live music performances, multi-day music festivals, and other special events. Covering local cultural happenings, First Friday gallery spaces and working with the editorial interns to document artist profiles, and any other creative projects we throw your way. Helping us capture our on-air programmers with programmer portraits to be used in programmer spotlights. Basic understanding of DSLR equipment, ISO, aperture and shutter speed functions. Experience photographing in low light and action photography. Adobe Creative Suite and/or Adobe Photoshop and Lightroom. Covering live music performances, multi-day music festivals, and other special events. Covering local cultural happenings, First Friday gallery spaces and working with the editorial interns to document artist profiles, and any other creative projects we throw your way. Helping us capture our on-air programmers by producing video documentaries for our programmer spotlights. Producing short video recaps of KZUM produced and/or sponsored events, including in studio interviews/performances. Attending all KZUM and KZUM sponsored events. Capturing subject(s) in a low-lit environment, producing clear and crisp content, as well as panning and the ability to capture subject(s) in motion. Creating event posters and associated digital/printed promo materials. Update KZUM program guide, First Friday map and other ongoing materials. Use KZUM’s and other creative design assets for special, and at times, time sensitive design needs ie; images for fund drive or other special promotion, etc. Assisting with audio needs for video production. Gathering audio as assigned at events. Adobe Creative Suite and/or Audacity. You will work alongside our development and multimedia departments creating coverage of in studio performances and interviews, programmer spotlights, and assist in marketing and fundraising campaigns. It’s an exciting time to be in Lincoln and an even more exciting time to be a part of the KZUM family. We look forward to your application! Questions? 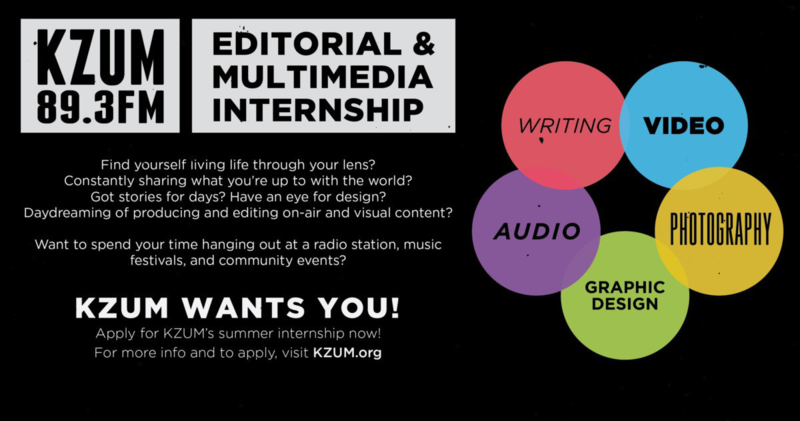 Email our Multimedia Specialist, Steffan Decker, at multimedia@kzum.org or call 402.474.5086 x.2. Please upload work samples below if not linking above or emailing.